So this has been a post in the making for a long while now. Over the last year or so, there seems to have been an avalanche of sorts when it comes to home delivery of food - from curators, to independent kitchens to home cooks and so many more. 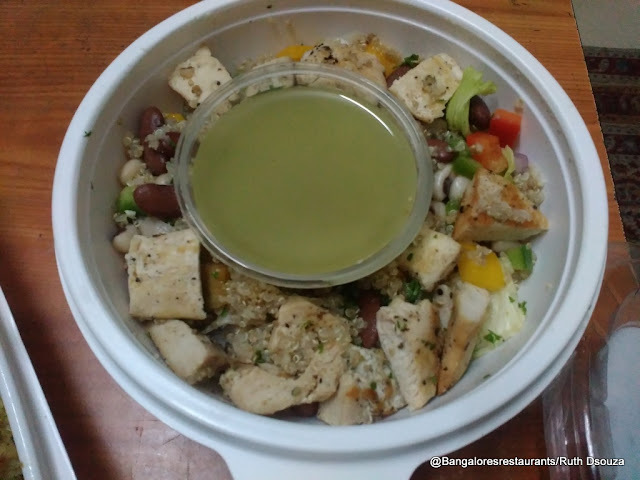 There was once a time when Tandoori Nights in Jayanagar was our one and only go to place for takeaway and comfort food - but now, we are spoiled for choice (PS: I still love Uncle and Tandoori Nights). I used to be extremely skeptical about online delivery services. Having been on the receiving end of "order was not registered", "its raining, our Internet is down", "We can't track our delivery boy", "We don't deliver to your area, despite confirming your order online that we can" - I was all but ready to give up with most services. 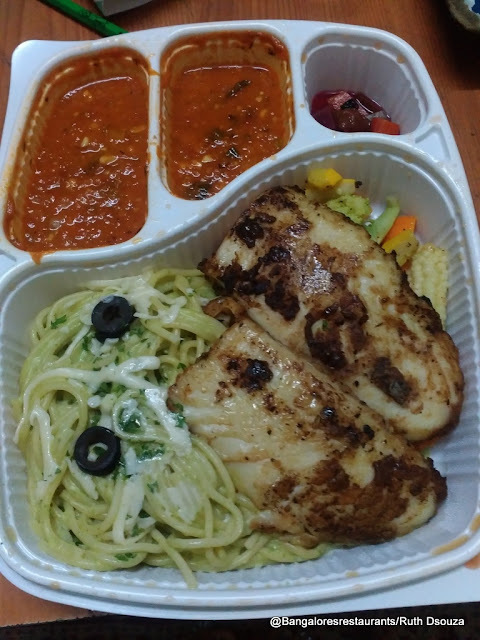 But then Sudhakar convinced me to give Freshmenu a go. So we ordered and the order came in 45 minutes later than it should have and I walked around with a "I told you so" look on my face. But our first order of a pasta and burger turned out to be so good, that I was willing to give it a go again. And I am happy to report that from our second order, close to around 6 months ago, I have never had an order come in late. Yes, on occasion, the chicken in the chicken salad was forgotten, or a dish was left out of an order, but that was rectified soon enough, with just a phone call. Every place is allowed a few mistakes. But bottom line has been that the food has always been worth the money. 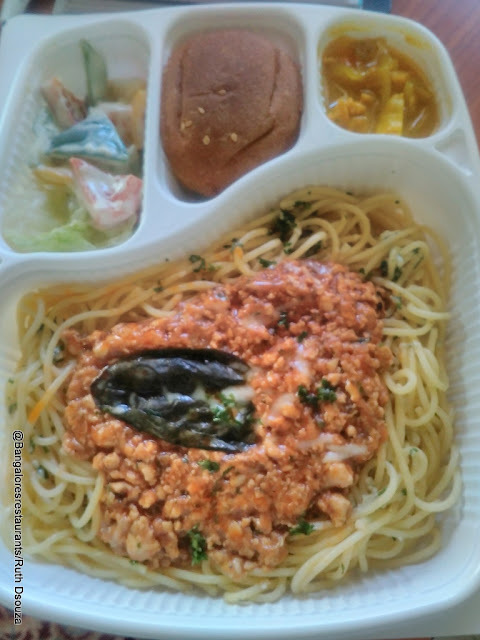 The food has always been good, the packaging great (I have found some great uses for the boxes outside of the kitchen!) and the innovation regular. The introduction of the breakfast platters were a great addition and very filling for a weekend brunch. In most cases, I just fried up some bacon at home and completed the breakfast platter the way I wanted it. The seasonal jams and preserves that come in are always brilliant. Christmas time saw the addition of some really good plum cakes and we ordered ourselves a few of those. Currently Freshmenu is on a specials spree and they are done with their Asian and Bread specials and are currently on their Burger promotions. 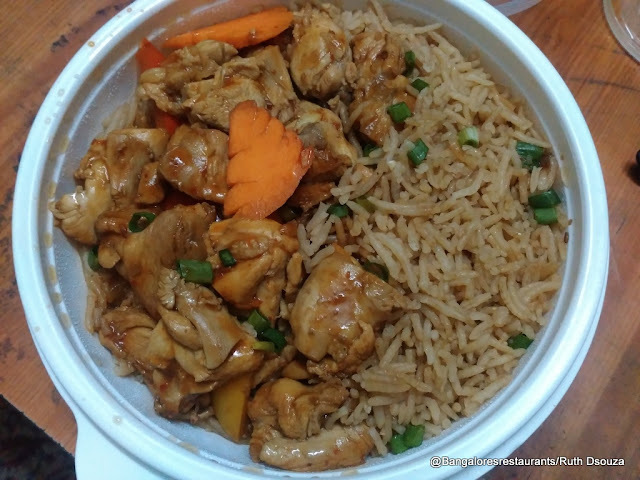 We have been sure to order something for each special each time. 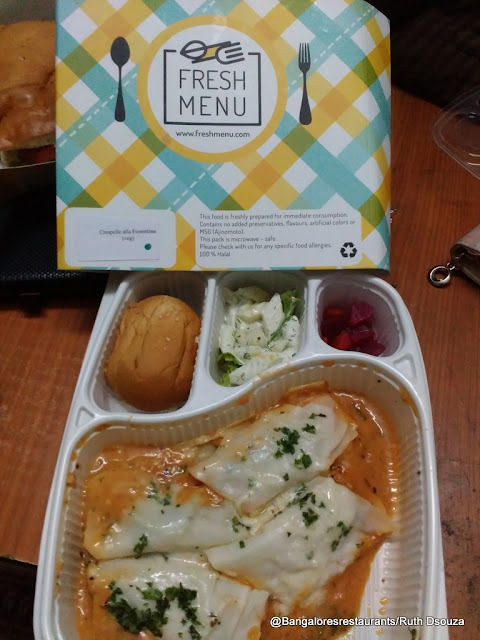 So Freshmenu divides their menu into Appetizers/Salads, Mains and Desserts. We don't usually do desserts, but this once we ordered a Walnut cake with caramel drizzle (I may have got this name a bit wrong) and it was fabulous. The salads can be a meal in themselves and I love that the dressings are never the staid vinaigrette or cream based ones. The orange dressing is a favorite. Special mention goes to their Chicken Quesadillas. I invariably order one of those every single time I see it on the day's menu. The salsa and the sour cream dips are what warrant the repeat orders from me. 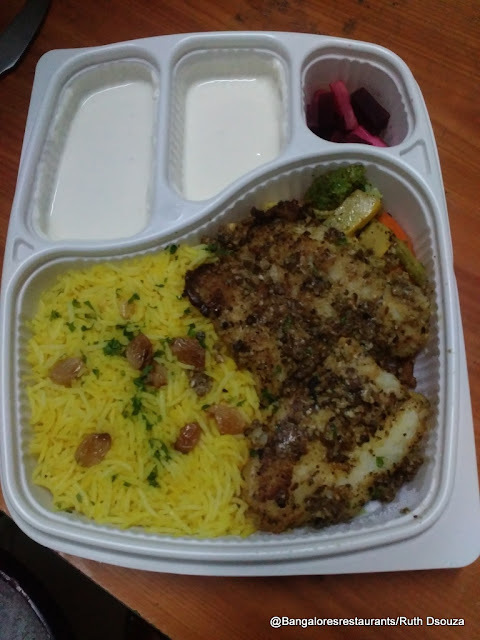 And so Freshmenu has become an integral part of the ordering-in culture in the Prabhu family. The fact that the prices are usually in the Rs 200 to Rs 250 for a main course, makes it an affordable good option. I am hoping their specials take them down the Mexican, Japanese and some interesting Indian cuisines way as well. Take a look at some of what we have ordered. All of these are taken on the phone or the point and shoot and may not really do justice to the dishes. But then hey - we ordered in and wanted to dig in, so had to be quick about it!. 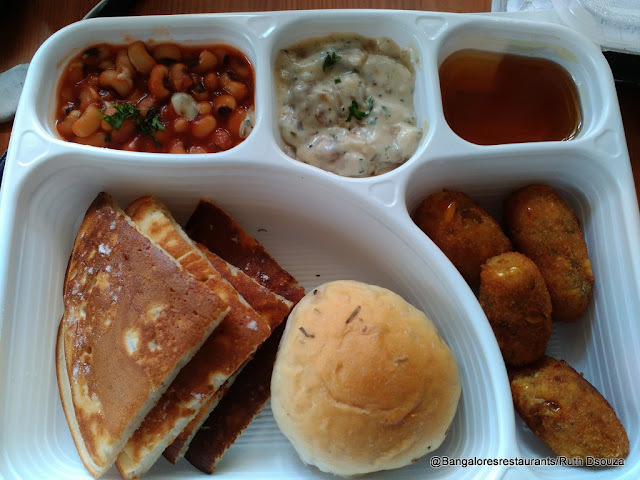 Breakfast Platter - With Pancakes and honey, herbed bread, potato croquettes, mushrooms in white sauce and baked beans. 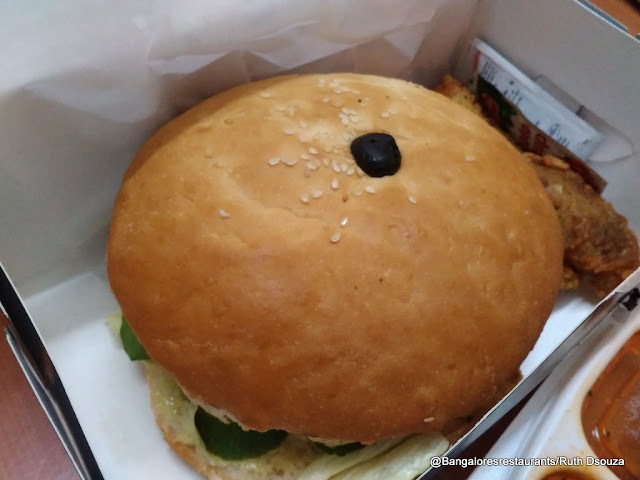 Tex Mex Titanic Burger - Sudhakar is a huge fan of their burgers. Always massive sized, but packed well and they reach us intact.